My family has been in ministry since I was a young child. My parents were saved and began going to church when I was only a year old. Very soon my parents began leading the preschool class with almost 100 preschoolers every Sunday. A few years later my dad became part of the deacon board. Then my mom became the children's pastor. Dad served on a deacon board for almost 30 years and my mom served as children's pastor for almost 30 years. Four years ago my parents became the lead pastors at our church. My parents are my pastors. My husband is our associate pastor and I am the children's pastor. My brother just became a youth pastor and my 18 year old daughter is studying to be a youth pastor. Ministry runs in our family. Because ministry runs in our family, I know all the ins and outs, all the hours and heart put in to it, and all of the hardships and blessings. I often hear people say a pastor preaches on Sunday then spends the rest of the week playing golf and having lunch dates with other pastors. These assumptions make me giggle. Oh if they only knew! I've watched my parents spend endless hours at the church whether for meetings, counseling sessions, or preparations for services. I remember the Saturdays spent shopping for batteries for the church microphones and clocks, light bulbs, supplies for children's church, the list went on and on. I remember fabulous Christmas and Easter programs then coming to church on Monday to put everything away and cleaning so that when the congregation arrived on Wednesday, everything was in place and ready for service. I've seen my mom and husband put hours into praying over and studying for a sermon and preparing for it, I've even done it myself. I watch my husband work a full time job, come home to shower and have dinner, then go to church for several hours to study for his Wednesday sermon. Then Wednesday come home from work, shower and sit with his sermon praying over it and studying through it one more time before service. I see first hand the hospital visits, phone calls at all hours of the day and night, the heartache when one of your church family is hurting, the pain when someone leaves the church, the hours and hours of prayer over your church people, and the physical work inside the church. There is so much behind the scenes outside of Sunday that so many do not understand. Please believe me that I do not tell you all of this for one ounce of sympathy or pity. I don't even tell you for a thank you! I tell you because I hope that it gives you a glimpse into all your pastor does for your church family. Ministry is not just a Sunday job. Heart and soul go into caring for a congregation. This is literally a 24/7 thing. But I tell you so in hopes to encourage you to return the blessing to your pastor. The biggest, most appreciated way you can do that, is to pray. Pray daily for your pastor. Pray for their marriage, their health, their relationships, their finances, and their ministry. Your pastor is human and has struggles just like you. So cover your pastor in prayer continually. Believe me friends, we need it. Let your pastor know that you are praying for them. There are tons of other ways to return the blessing to your pastor, all deeply appreciated. But we covet your prayers. October is Pastor Appreciation Month and Dayspring has an amazing campaign going on right now called Return the Blessing. They are encouraging church goers to return the blessing your pastor has given to you. They offer many great gifts and cards that center around ministry work. They also have ideas for you to bless your pastor. 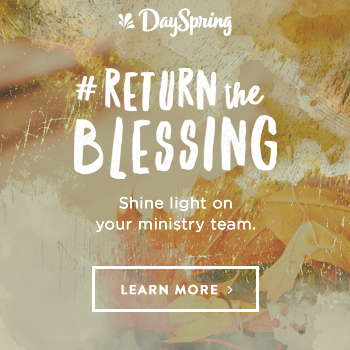 Click here to see the different ways Dayspring suggests as a blessing. They are offering an amazing deal right now, get $200 off any $60 purchase by using the code FALL20. To browse their beautiful gifts, click the image below. I love their beautiful Faithful Servant Framed Artwork! This is what I gave to my pastor/mom. 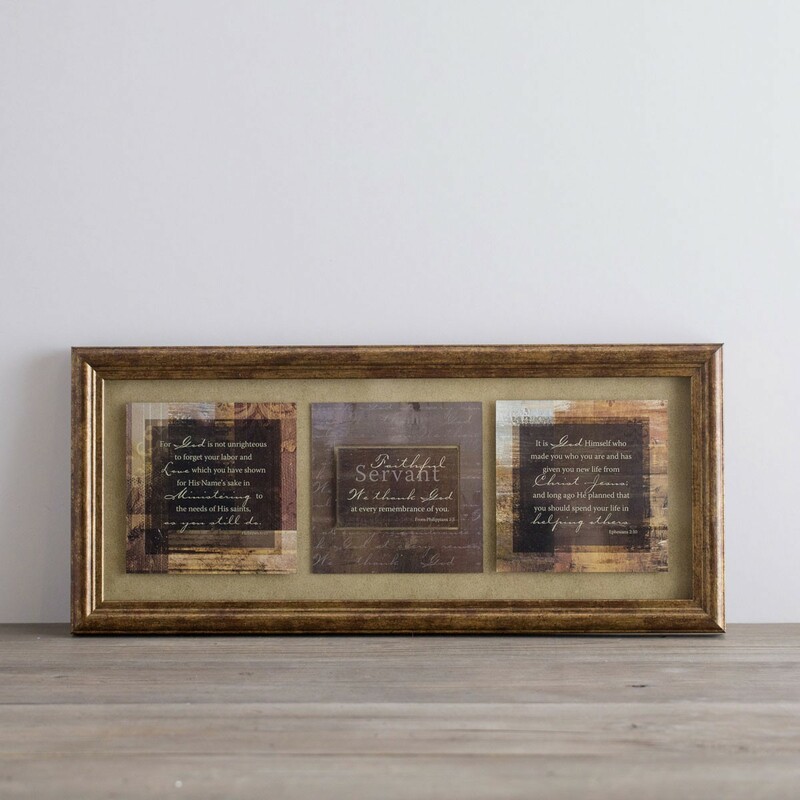 This is a lovely piece that can grace the walls of your pastor's church office or home. 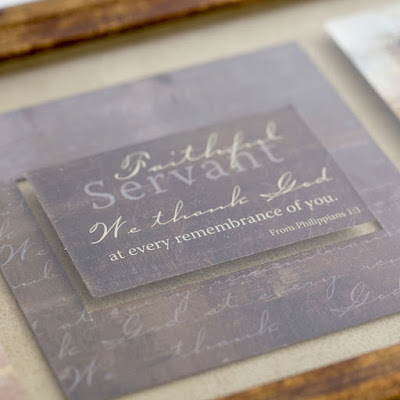 It talks about being a faithful servant and says thank you. This is something your pastor will love! To my pastor, my mom, and to my associate pastor, my husband, I thank you both. From the bottom of my heart, thank you for all that you do for our church. I deeply love and appreciate you. To enter Dayspring's giveaway, click here. Whew!!! I know what we do and yet to see it in print (so to speak), it makes me tired! But it is one thing in my life I WOULD NOT change for the world. I am so blessed to be called by God to minister to His children!! Thank you for the beautiful gift from DaySpring! It is gorgeous. Having people in our congregations like you...make it easier to endure all the work, prayers, studying and so on. How awesome that all of you were called to ministry. My daughter and I have been children's co-leaders in our church before and it is a lot of work, but we enjoyed it. Thank you for the reminder that it's Pastor Appreciation Month. Thank you for all you and your family do for your church.